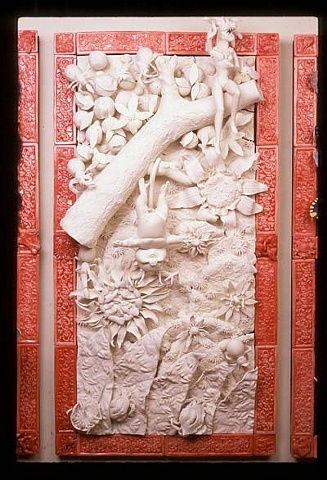 'The Fall,' a scene from the first garden, with the stage set for original sin. Jurassic Barbi is up in the tree, with Medusa-snake hair (and a beaver skull around her neck); Slam is already experiencing the bliss of the fall, but he has a possum tail to catch him. The whole construction is low-fire bisque.